This is a well-written, relatable and touching coming of age story. Frances is the studious, hard-working head girl of her sixth form. She has an array of top grades and is destined for a future in Cambridge University. Aled is the quiet, mysterious and intelligent boy across the road. Frances has no idea how her life will change when she discovers that Aled is the anonymous face behind her favourite ever Youtube podcast series. This story takes a lot of twists and turns along the way. We see both Frances and Aled walk along a road to revealing their true selves to one another. As they both peel away the layers, we get treated to a beautiful, touching friendship between the two of them. A friendship where they can both comfortably be themselves. As we delve into their world and learn more about the intense fandom of <i>Universe City</i>, Aled’s famous podcast, we see the reality of being ‘internet famous’. This has almost devastating consequences for their friendship: will they be able to move past this and come back to one another? Underlying the story of their friendship, this book delicately looks at so many themes: the difference between having a supportive mother or an abusive on, sexuality and relationships, finding yourself, living your life for you and not others. So much happens in this book that young people will be able to relate to. Whether it be the pressures of school or conforming to society/friendship groups, relationships with parents or living that secret teenage life behind closed doors. There is really something in this book for everyone. The writing style is so easy to read and I couldn’t stop turning the pages. The characters are incredibly diverse, whether it be by sexuality or race, this is such an amazingly diverse book. I could see a lot of myself in Frances: the girl who is expected to be a certain way but can’t always keep up that mask. There were so many points in this book where I just wanted to take Frances and Aled and remove them from the difficult situations they faced. I really wanted them to feel loved, especially Aled. My favourite character in the book is actually Frances’ mum. She reminded me a lot of my own mother: supportive, understanding and caring for Frances’ happiness before anything else. She was so different from Aled’s mother and I loved how Oseman contrasted the two in order to show how different the life of a young person can be as a result of treatment by their parents. I originally was going to give this book 4* but as I’ve been writing this review, I have realised that I can’t actually fault this book. The one tiny thing I would have changed would have been the story surrounding Carys’ disappearance. I really felt that this was being built up to be more than it was, but it still fitted in perfectly with the story and it still felt meaningful at the end. I loved how real this book felt. I think there is something in here that every individual will feel they can relate to. Whether it be the secret internet fandom lifestyle, trying to live up to other people’s expectations, not knowing what they want to do with their life or not knowing who they truly are. There is so much in here that is relatable and real. A great coming of age story full of love, laughter, sadness and teenage angst. There is something in this book for everyone, I highly recommend it. 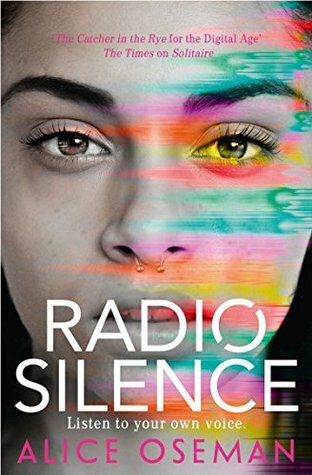 Have you read Radio Silence? Or the author’s debut novel Solitaire? What did you think? I think I’m going to buy this book ASAP and read it! Thank you for sharing this so many times and linking your review to other posts! Thanks! I didn’t realize it wasn’t out yet though! So I may have to preorder it and wait. Oh, yeah it was out in the UK last year but I think the US release is soon! Yeah, it releases here on March 28th! It is SO good! Definitely recommend!